1. Place 4 glasses in the freezer. 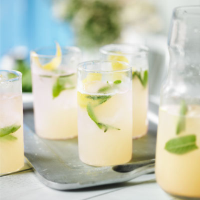 Pour the gin into a tall container or jug with the sliced lime, rosemary sprigs, mint sprigs, lime zest and juice. Reserve 4 strips of grapefruit zest then add the remaining grapefruit zest and juniper berries to the container (or jug). Pour in the grapefruit juice and ginger beer. Using the bottom of a rolling pin, crush or ‘muddle’ the ingredients. Remove the glasses from the freezer fill with crush ice, add the rosemary leaves and mint tips. 2. Strain through a fine sieve into another container then pour into the glasses. Rub each of the remaining strips of grapefruit peel around the rim of each glass, twist them and then add to the glass and serve.